Antionette is a cute, soft-spoken, petite girl. She is making great progress academically this past year. She loves school and loves to read. She enjoys playing games and playing outside. Ray'Jon is a handsome teenager. He is athletic and would like to participate in physical sports such as wrestling, boxing, and/or football. He is an average to below average student, but with better organization and more effort, he has the potential to do better. He is a good writer and in his spare time he enjoys doing word search puzzles. 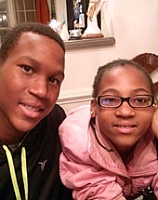 We are seeking an adoptive home for both of these young people.